The Marple Website becomes a "full time job"! I've long harboured a desire to take early retirement, who hasn't, but until January this year I never imagined it would be possible to pack in my day job at the tender age of 55. 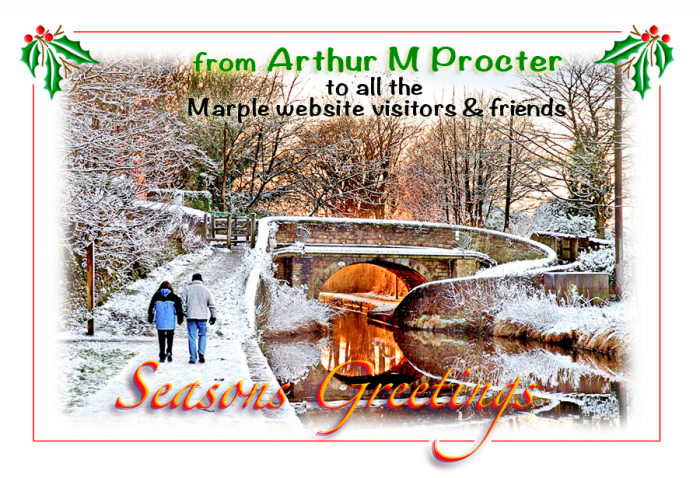 Despite these doubts, and much to my surprise and delight, this did prove to be possible and I retired from full time work in February 2013 to concentrate on family, The Marple Website, the small web design business that has developed from it and Friends of Marple Memorial Park. To be honest, especially with the current challenge of the Skatepark Development Project, the park feels like a full time job all on its own at times! The Marple Website donates £500 to Marple Skatepark! With much of my focus on the Friends of the Park Skatepark Project this year, The Marple Website was pleased to make a donation of £500 towards this from the banner advertising income on the main site, the forum and the Virtual Tour. The good thing about this too is that it was made via localgiving.com during their 2013 "March Match" Funding Campaign and was therefore doubled by a £500 donation from Forever Manchester (less localgiving fees) to £986! We're hoping that there will be another opportunity to do this in March 2014. This follows on from being the main sponsor of last years Marple Christmas Cracker and continues the contributions made each year by the web site to local causes that first began in 2006 with the Iron Bridge Project and has now reached a total of £7,200. For the last three years this has only been possible thanks to the support of the local businesses that have taken up the opportunities to advertise on the site, so a big thank you to them - click here to see who they are. A banner advert is a great way to promote your business and support your local community web site at the same time. There's also a sponsors' area of the forum that advertisers can now use if they wish. Please note that banners are only available to local Stockport based businesses and there are discounts for Marple Business Forum members too. So if you are interested in promoting your business on the site have a look here, and get in touch. 2 Million image views on the Marple Website Virtual History Tour! Another landmark milestone was passed in November this year with over 2 Million image views on the Virtual History Tour. With the counter now at 2,047,800, records have been broken once again because that's 427,185 image views since Christmas 2012. Can we get to half a million views in a single year for 2014? That amazing challenge could be possible thanks to the ongoing support of Marple Local History Society, who continue to share their photographic archives with the community through the site, and Arthur Procter, whose excellent efforts to record local events for posterity are creating a historic record for the future too. With contributions from Arthur and several others too, these have included this year's Brass Bands Northern Area Championship, Ludworth School Swimathon, New Horizons' Volunteer Day, Stockport Hydro Opening, Marple Carnival, Marple Locks Festival, T20 Cricket at Hawk Green, Chadkirk Festival, Mellor Mill Heritage Day, Marple Food and Drink Festival, Marple Carnival Presentation Evening, the Remembrance Service in Memorial Park and Marple Christmas Cracker and other 2013 Christmas events. With a current total of 8,737 images on the Tour, more than 1,100 new ones have been added since last Christmas. As well as those from the History Society and Arthur, a good number have been provided by other individuals too. Special mention is due to Ray Noble and Steve Abbott for their contributions and my thanks go to everyone who has helped to keep the collection growing. Please do keep sending your local photos in, old and new, throughout 2014. A web site at the Heart of the Community! Despite many organisations now having their own web sites The Marple Website's Community Pages remain important as a central hub that enables local groups, with or without their own web sites, to promote themselves to a larger audience. This year new members to "sign up" are Compstall Cricket Club, Marple Community Fire Station, Stockport Hydro, High Lane Girl Guides, Marple Athletic JFC, Marple Naturalists, Mellor Country House, Mellor Tennis Club and Marple Rugby Club. New groups are always welcome to join the Community Pages. All you have to do is provide some words and pictures to get started - it couldn't be easier, so do make the effort now. If your group wants to set up its own site then I can also provide low cost hosting and support to help you to do this if you need it, just like has been done for Marple Local History Society, Mellor Archaeological Trust, Marple Carnival and Marple Athletic JFC. 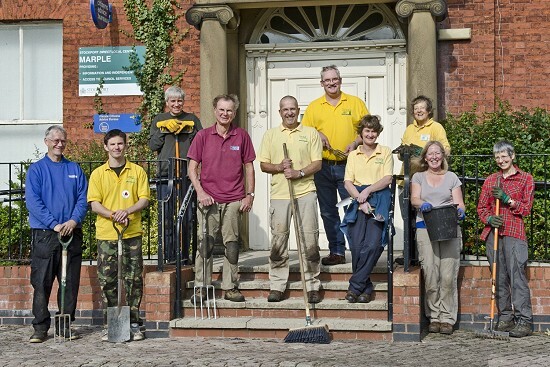 Congratulations to Mellor Archaeological Trust! Fantastic news for Christmas that Mellor Archaeological Trust and the Canal and River Trust have made a successful joint bid to the Heritage Lottery Fund for "Revealing Oldknow's Legacy". The award of £1.5 million in September 2013 will fund work over the next 3 years down at the site of Mellor Mill and Roman Lakes and also along Marple's historic flight of locks and at the Marple Aqueduct. The project includes removing some of the trees at the Aqueduct and making it more visible and accessible - this is particularly exciting as it is something that was first raised on The Marple Website in the year 2000. To be able to see the Aqueduct properly, the way it looks in old photos on the Virtual Tour, will be fantastic! It was also exciting that The Marple Website was able to play a key role in bringing an original oil painting of Mellor Mill by Joseph Parry back to where it belongs. In 2006 then owner Sean White got in touch after searching the Internet for information about a painting he had recently purchased. 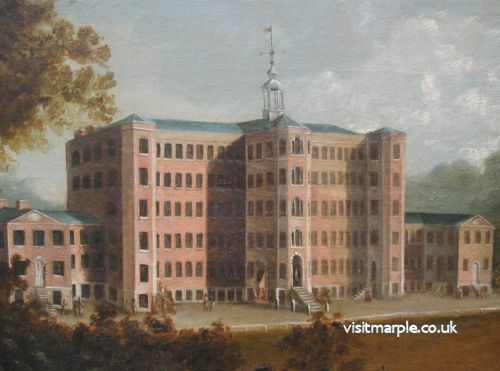 He had found The Marple Website's history of Mellor Mill and this helped him to confirm the subject of the painting and to identify that it was the original oil painting that a well known engraving of the mill was based on. Sean shared some photographs of it on the Virtual Tour at the time. Then in 2012, when he'd decided to sell the painting, he got in touch again. I was pleased to be able to facilitate a meeting between Sean and the Mellor Archaeological Trust, who agreed to purchase it for display in the local community. The Trust launched an appeal for funds that was very successful and the painting is now in the process of being restored, which you can read about on the MAT web site. It is expected to be hung in Marple Library early in the New Year. Happy 10th Birthday to Friends of Marple Memorial Park! It's now exactly 10 years since the formation of Friends of Marple Memorial Park, in December 2003. My wife Gill and I are proud to have been involved since the begining, as have fellow members Micaela and Terry Wood. There are quite a few regulars who've been helping in the park for a very long time too, plus others who've become involved more recently and are all making a fantastic contribution to our community park. As well as 10 years of service maintaining and improving the park by volunteers, we've achieved another amazing milestone with our fund-raising, which has recently passed the grand total of £50,000! This is purely the money raised by the group directly and passed through our own bank account. It doesn't include significant sums contributed by others that we've played a key role in securing, like funding for the Infants and Junior Play Areas and Basket Ball Court Fencing that have been administered by the council. Forever Manchester has acknowledged our fantastic success over the last 10 years with an FM Award of £1,000 just last month. When we applied for this we asked other local groups for supporting comments to go in the bid and in a period of 24 hours we received some marvelous tributes that helped us to win it. Here's a copy of them interspersed with photos of the park. 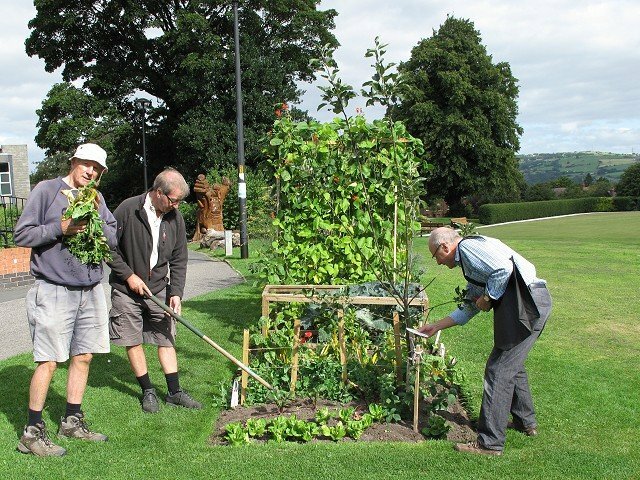 It turned out to be a great idea to invite Marple Allotment Association to adopt one of our flowerbeds in the park this year. Both we and the allotment association members have received many positive comments from visitors to the park about this and it's been one of the outstanding successes of 2013. In fact, as I write, the Allotment Team are in the process of doubling the size of their plot for next year, so there will be even more rich pickings in the park during 2014. We won a visit from the Kärcher Clean-Up Team this year too and it was a pleasant surprise to learn just what a fantastic prize it was! We had a day-long visit from the huge Kärcher Clean-Up Squad and volunteers from Keep Britain Tidy. Including local volunteers who came along to help, at one point during the morning we had more than 40 people working to clean-up our park. Even Marple's Firefighters came along to support us too. In addition to the Clean Up Day Friends of the Park also won a "Kärcher Clean-Up Kit", comprising a top of the range Kärcher Jet Wash, a Kärcher Steam Cleaner and a Kärcher Window Vac with a total recommended retail value of around £700 - so it will be much easier for us to keep the park sparkling clean in the future! Hopefully everyone knows about Friends of the Park's most ambitious project yet, which is to upgrade and extend the Skatepark in Marple Memorial Park. We've been working on this since 2011 with Lewis Abbott, one of the skaters who campaigned for the original facility, several other older users of the skatepark, Marple Hall School, Marple Library, SMBC, Marple Civic Society and Marple Vision Partnership. Friends of Memorial Park £2,200; Raised at Local Events £1,713; Forever Manchester £1,500; Stockport Homes £1,313; Marple Area Committee £1,000; Marple Carnival Award £1,000; Bag Packing with Local Schools £928; Ring o' Bells Quiz Nights £819; House-on-the-Hill Software £500; The Marple Website £486; Marple Firefighters 10k Trail Run £400; NatWest Marple Branch £250; HLG + Murson Cars £200; Marple in Action £161; All Saints Church £139; New Mills & Marple Rotary £125; Recon Cycle Repairs £110; plus miscellaneous donations of £392. As part of the project we spent £1,909 on putting on a Skatepark Event during Marple Carnival and this was a great success too, helping us to raise awareness of what we are doing with the community and to engage with the skatepark users of the site. We still have a long way to go with fund-raising to meet our target. We need to continue engaging with skatepark users and finalise the skatepark design, obtain planning permission, go out to re-tender and get firm prices, make a successful bid to the Veolia Environmental Trust and find an independent contribution of around 10% before work can start. So it's still going to be a big up-hill battle throughout next year. So if you can help in any way, please do get in touch. Despite a campaign by local groups like ours across the borough that helped to reduce parks and open spaces budget cuts from £1.2M to £550k in 2014/15 it's certainly not all good news for the park. The coming year is expected to bring many new challenges as the council staffing levels are drastically reduced by the cuts and we will loose key personnel like Bob Wilson our Community Parks Officer and Team Leader Adrian Ellis, who we've worked so closely with over the last 10 years. It's hard to understand exactly what impact this will have on Friends of the Park activities but we'll do our best to overcome whatever problems arise. One thing's for certain - we will always be able to use more volunteers, so come along and join us if you love your park! I'm very grateful to Forum Moderators Lisa and Howard for continuing to help out throughout 2013 and I'd like to extent my thanks to them both and to everyone else who supports the web site and keeps on coming back - that's what it's all about after all.